Together with the famous designers Stefano Righini and Carlo Galeazzi the Azimut yard designed a new 105' motor yacht that positions herself just between the 98' Leonardo and the 116' flagship. The new 105' is a semi-gliding yacht whose characterizing, very fast bottom, designed in conjunction with Sydac, has a deep Vbow with deadrise of 10.5'. In designing interior the architect Righini wanted to interpreter his own concept of a yacht open to the sea and to the all - round - view drawing up this 105' with giant outside areas and wide side windows wrapping around both the decks. Outside the spacious areas are emphasized by the flybridge layout featuring four areas conceived for relaxing, dinning and conversation. Moreover, still on the same bridge aft of them there are sunpads for sunbathing with chaise longue and hydro-massage tub. Interior, whose décor is by Carlo Galeazzi, features the same décor subjects as the new Azimut 75'has and is characterized in way that furniture are not bonded to the floor, as onboard the most yachts on the market is, but separated from it. 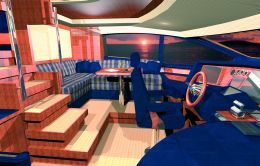 All this is in order to underline the idea of creating yachts as ideal extension of owner's house or flat. Furniture is in satin cherry with orthogonal veneers giving the whole an impressive three - dimensional look. The curtains lap the floor and the simply, square - designed ceilings recall the same fine - looking effects of the furniture. Lighting, guaranteed by day by wide wraparound windows, is provided at night by diffusion spotlights covered by wood panels. Taps and accessories are square-shaped as the today's trend likes. Interior layout is available in two versions: the first of them features an owner's suite aft on the main deck and four guest cabins on the lower one. The second layout features a whole sleeping area stretching along the lower deck while on the main deck there is the living quarter with galley, saloon and dining area. The first launching is set for late spring, while the second units to be put on the U.S.A market will be introduced in 2006 at the Miami Boat Show. Fur further information please contact: Azimut - Benetti Yachts; I - 10051 Avigliana (TO),Via M.L. King 9/11; phone number: +39 (0)11 93161; fax: +39 (0)11 9367270; web site: www.azimutyachts.net.